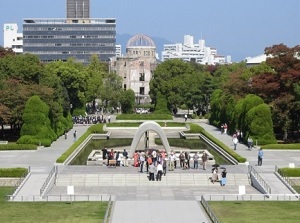 Hiroshima Peace Memorial Park is a park to the south of Genbaku Dome. The site between Honkawa river and Motoyasu River is about 600 meters from north to south and about 350 meters from east to west. After A-bomb was dropped and the Pacific War (World War II) finished, the construction of a park to appeal for world peace and never to repeat the foolish mistakes by humankind was planned. The park was completed in 1954 in this place near the center of explosion. On August 6th every year, Hiroshima Peace Memorial Ceremony is held here. At 8:15 a.m., participants offer a one-minute silent prayer for the victims. For this one-minute, all streetcars and buses in Hiroshima also stop, and all passengers offer silent prayer. Then the Mayor of Hiroshima makes a peace declaration, which is sent to the leaders of nuclear nations around the world. 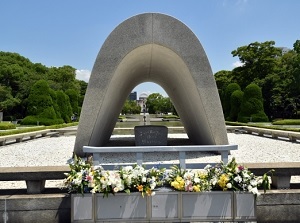 In the center of the park, there is "Memorial Cenotaph" covered with a concrete and saddle-shaped monument. On the cenotaph, the words to the victims are curved. "Let all the souls here in peace; For we shall not repeat the evil." 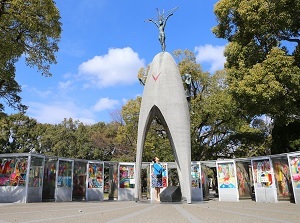 In the cenotaph, the name lists of all of the people killed by the bomb has been housed, and new names of the people died from atomic bomb disease in the year are added every year. Now the lists have over 250 thousand names. In the park, there are many other monuments. And, Hiroshima Peace Memorial Museum is in the south part of this park. By street car with route No. 2 or 6, about 20 minutes from Hiroshima station to Genbaku-Dome-mae stop. From Genbaku Dome, about 5 minutes walk.